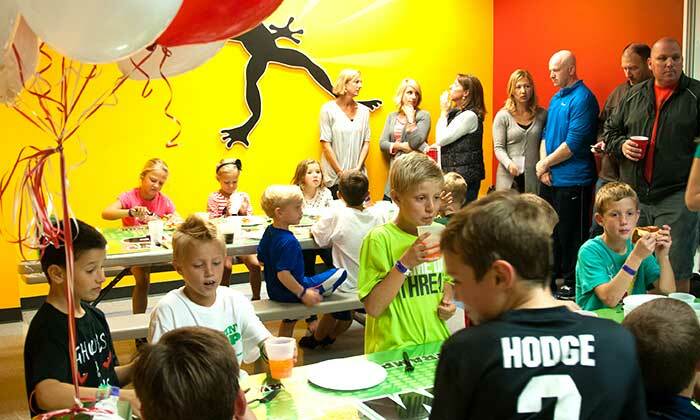 There are plenty of reasons to host your party at Epic Play Zone. We can accommodate up to 100 people for Group events. Be it a group function, sports team celebration, Graduation party, Family re-unions, lockdown parties, fundraisers, charity events, or private parties, give us a call and we would be happy to plan out a celebration and party that is perfect for you. Remember, our attractions are not just for kids, it is a blast for adults too and so if your party is just for adults it will be a memorable event for sure! We are happy to serve you for extended hours on holidays or school PA days. Check out our events page, Facebook or give us a shout and let us know your specific requirements! Socks are Mandatory to enter the play area. Socks are available at $ 2:00 per pair. Additional time – $50.00 + HST for ½ hour / $100.00 + HST for 1 hour*Only nut free food is allowed from outside. Our Facility is strictly Peanut free. No substitutions or discounts for unused party package items. Epic Play Zone previously known as Epic Lazer Tag is the largest and first kid’s birthday party center in Milton.